← Meet Avionero’s Co-founder: Anton Tyulenev! Having an idea of when you want to travel is a must for most travel sites. 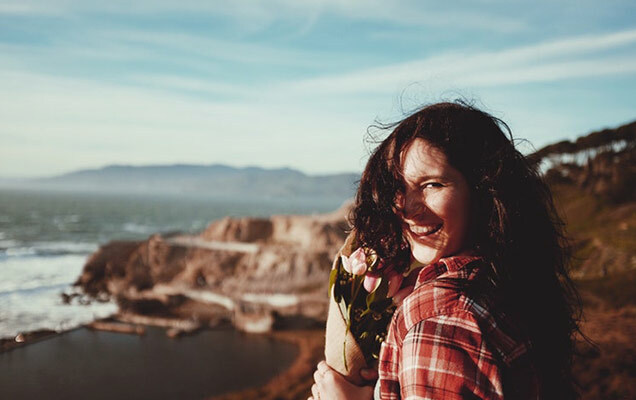 However, while planning a trip you might not always know exactly when you want to go, and often you have to research a lot to get to know when the flights are the cheapest. At Avionero, we think curiosity matter, and it’s important that the process is as easy as it can get. Therefore, we’ve created a function which meets the behaviour of a lost traveller: Searching without specific dates. You often have to type in made up dates to get a general idea of where the cost lay when searching for flights. Perhaps you don’t know when you can be off work, but still want to have an idea how much a trip could cost. With us, you only have to know that you want to travel — and we’ll help you decide when. Lars Kristensson is the co-founder of Avionero, and the ability to search flights without dates was one of the core ideas of Avionero. The idea to search for flights without dates came from the observation that most online searches are made only to find out the cost of a flight. Perhaps you haven’t decided a specific date for your travels, but you’re only interested in having an idea of what you’d have to pay, which is why you type in fake dates, or at least try different dates. This in turn means that most searched dates are fake, or undecided. I was then hit by a question: “How can we make it possible to find the information the user wants, only by using the information they have — the destination”. I joined this idea with a keyword optimising mindset, integrated with the user’s need of information expressed before they type in Avionero in their search engine. This, so we’re able to meet the existing demand all the way from the search engine. 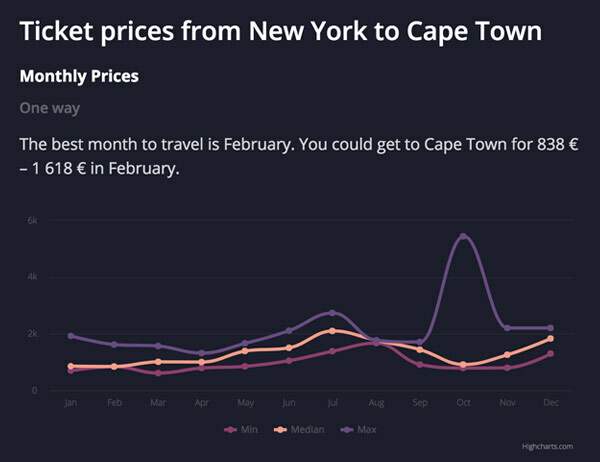 Let’s say you want to go from New York to Cape Town, but don’t know when, and you want to know the difference in cost. This information is enough for us. We can give you a compilation of price range, monthly and weekly average prices, when it’s most popular to travel, the distance between take off and landing, as well as what airports are most relevant. This means you can search without providing any dates. 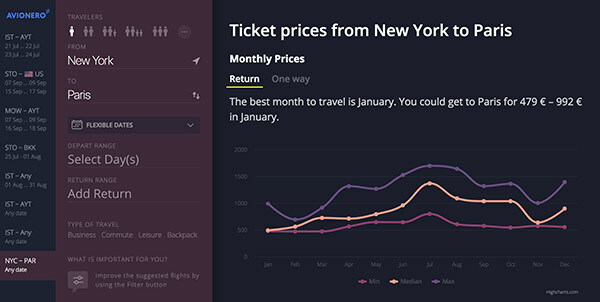 With a simple click, you’ll know exactly how cheap your flight can be, and when it’s best to travel — both what month and day of the week. The information is presented in clever graphs, showing a clear general picture. To sum it up: even though you have no idea of when you want to travel, you can still have a clear picture of where. We want you to find it as simple as possible, and to have fun searching for flights – even in the very beginning of your planning. Try it out with your dream destination!